Horses tend to be weary of the sound both the bow and arrow make. Before we start shooting after a pauze I will accustom to the sounds again. Picture one is me grooming whilst of my son and a friend playing and thus not drawing any focus to the bow and shooting. The following fotos are an impression of the rest of the 'procedure'. Interesting process. I had never heard that before. Looks like you live in a very nice area as well! Looks similar to how you get horses used to gunfire. Sure it is very like gun-training. The complication is that this sound is not one simple if loud bang. Those are cute pictures of your son shooting the bow off your horse's back! Great fun! I've also done the bit of leaving a pistol or carbine in the stall, next to their hay while they eat. I used a play cap-gun first, but after it was destroyed by being stepped on... well, back to the real ones. I just don't leave them in there overnight! I did some horse-archery last Summer too, and yup, that "Whoosh-THUNK!" is just as scary for some horses as the "Snap-BANG" of a pistol. Well, almost. We got them used to it fairly quickly though, and I was managing to do some fun runs down my tilt shooting the bow at a sheild we hung up on the quintain. I never did get that third shot off, though... Not enough time! Anyway, thanks for posting those pictures, Peter. Andalusia looks lovely in the Spring! Well, Gordon, horses sometimes "jump the gun" when hearing the sounds of a bow as well. I've been in a ranch where the horse-archers had a great deal of trouble wit ha particularly skittish gelding who bolted as soon as it heard the sound of an arrow scraping the side of a bow at the beginning of the draw. I don't know how much worse it would have been if they had used a modern bow with a clicker instead of an ordinary traditional bow, which made a great deal less noise than any modern competition bow I've ever seen or used. As horses have a VERY keer hearing and this is hardwired to an alerting fright-reaction, soft 'stealthy' swishing sounds are a lot worse than a simple loud bang and over. Like I wrote the problem with the bow-shooting is that the 'frightening' sound happens áfter the horse has had time to go in alert mode. Horses will learn ths sequence of events VERY quikly and indeed the rustling of the fearther will be quite enough for a horse to know it might just as well take of at that moment and avoid the arrow hitting home. Only one experience with a rider delaying the shot because of the horse moving is enough to learn the horse that an alert jump equals no noise from the target. Once a 'succes'-experience like this has become learned it is impossible to 'cure'. A very good rider might improve the reaction but it will always be there and pop up under a different rider. Makes one wonder how horses reacted to an arrow storm in a battle between a bow or horsebow culture, that might have horses trained to ignore the sound of arrows, and another culture were the bow was little used and the horses completely unprepared ( trained ) to face mass archery ? ( First battle(s) i.e. initial contact with a culture using a different fighting system ). Could this have been another reason the French had to dismount in some battles in the 100 years war ? At least when the French faced the longbow early on ? I would imagine some desensitizing training would have been used later to re-give the French Cavalry some effectiveness ? Obviously, the same thing could be said later on with firearms and canon on the battlefield. I think that you're absolutely right that there is a lot to the English mass-use of archery, and not simply the arrows falling fast and thick among the French Chivalry that was a problem. The noise of thousands of bowstrings thumping and arrows whistling, being somewhat unfamiliar, combined with the screams of men and other horses from the pain of being impaled would definitely be a factor! Horses have to be desensitized over years of training to this stuff, and every time a new noise or action comes up, new training comes into play. Bows/arrows, then firearms being fired AT, then FROM, etc. Good point, Peter, on the delay problem. But since guys successfully train their horses to the Mounted Cowboy Action Shooting game, which involves lots of cocking, shooting, and running around, I'm sure that they can get used to anything eventually. Eventually! Well Gordon a good rider-horse combination based on mutual trust has quite a bit of margin. This said horses MUST be trained with forethought. Horses cán be formidable tools of war IF one ALWAYS takes into account that they are programmed to be professional claustrofobics with a conspiracy theory. The program 'horse' was the reason I earlier wrote, in another topic, that guerilla type skirmishing is the most suited role for true mounted warriors. Not by far the only, but the almost universal mounted footsoldier or dragoon, rather prooves the point. Btw Gordon, advanced another step towards a weapon permit today. With the two new forms added to the earlier two I can go to regional police HQ after getting a medical exam. The 'Civiles' will no doubt tell me which form(s) are missing. Some where there is a very un flatering pic of me in midair holding a rifle while the horse I was on is doing mach-10 sideways. Always make sure you and the horse are on the same page. Ah yes, the "Bomb-Proof Horse" that "has never done that before"! Great on the weapons permit! I hope that the process continues to go well, and that soon you'll be posting photo's of you shooting off your horses (rather than them going sideways in one direction, and you in the other, as with Bill here... ) Good luck on both of those processes! Well. now you HAVE to find that pic and show it to us. Will look for the photo. As to bows here are mine. Although the genaral perception is that the role of the horse as a war machine is a thing of centuries past this is not true. In réaly rough going neither wheeled not tracked vehicles are of use and footsoldiers not at all surprising. During WW2 several mounted commando units were employed and with such success that the US-army kept this alive and again adopted this strategy in Afghanistan. The units rode into the difficult terrain and got off to fight. Space age true dragoons. What I like a lot is the idea of the lanyard to attach the gun to the rider in combination with a quick-release snap on the scabbard. After 3 hours of red tape the application has been entered into 'Thé System'. I should not expect an answer earlier than in two months time. If the permit is granted I can buy the (gun)s. Those come with documentation which I need to present with the guns aat the Guardia Civil. If all is found in order I can apply to have it registered to my name. That will taken its time too. I will thén receive the registration and this together with the weapon permit allows me to shoot on my own premises. I can then also apply for a permit to hunt form the regional Federation. This however is nót the same as a being allowed to hunt. No, that is the permission in géneral and with tháy you can go to the local club to become a member and apply for the right to actualy hunt. Oy! Sounds complex! But it's great that you've started the process at least. Good luck with it! Lucky kids. I wished I was able to shoot my bow from horse-back. 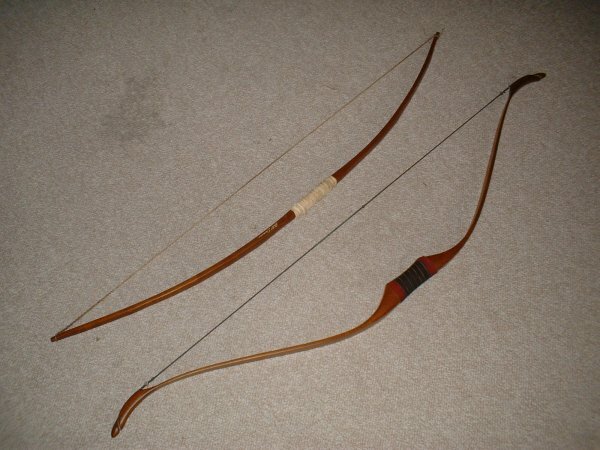 Also, I'm ashamed at the bow type your using Peter and Bill. Be real men, use a English longbow! Perhaps, but they're bloody hard to use from horseback! Especially the serious 125-lb and up Longbows! You need to stand on your own two feet to properly send your cloth-yard shaft into a Scotsman's bum at two-hundred yards with one of those big boys. Besides, a good Hungarian or Turkish shortbow gives a lot of power in that little package... which you can easily shoot from horseback. is a work of art, weighs just over 300 grammes, is 48" long, draws 34" and with 35# drawing weight shoots simple, wooden arrows accurately over 100 yards. I draw 32" and can manage just under a dozen per minute. From horseback I am just as fast but can only hold a few in my bowhand. Getting more from the scabbard needs time. I guess warriors could manage to get 5 or 6 into the air during the charge. The next trip to Málaga I will buy some modern thin lightweight carbon arrows as these will vastly improve the efficiency of my ultra-fast bow and shatter less easily.